When I think of a crunchy salty snack... chips, french fries and carb loaded goodies (everything I have been craving this pregnancy but resisting) come to mind. I recently heard about cauliflower poppers and I knew I had to try them. I have said before that I am not a big fan of raw cauliflower (yucky) but after I made skinny mashed potatoes using cauliflower I knew it was my new favorite lo-carb substitute. Wash and clean the cauliflower. Cut off and discard the stem. Cut the cauliflower up into small pieces. 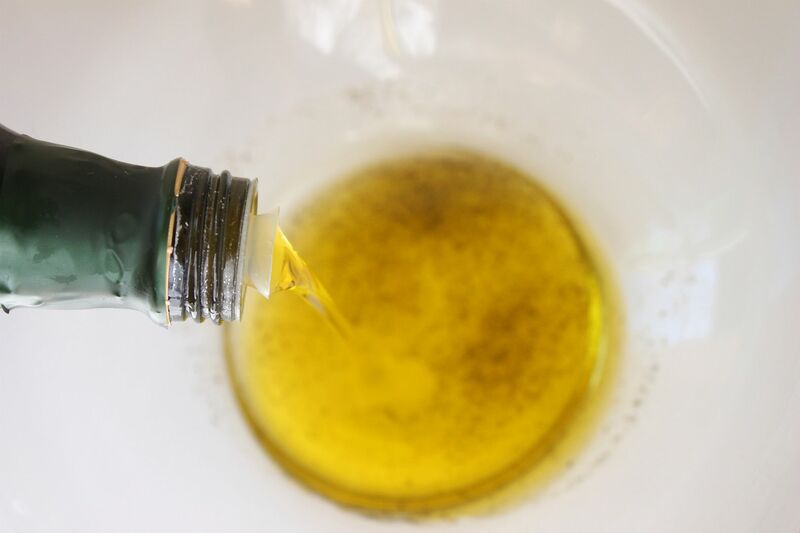 In a large bowl, combine the olive oil, salt and pepper. Add the cauliflower pieces and thoroughly coat each piece. 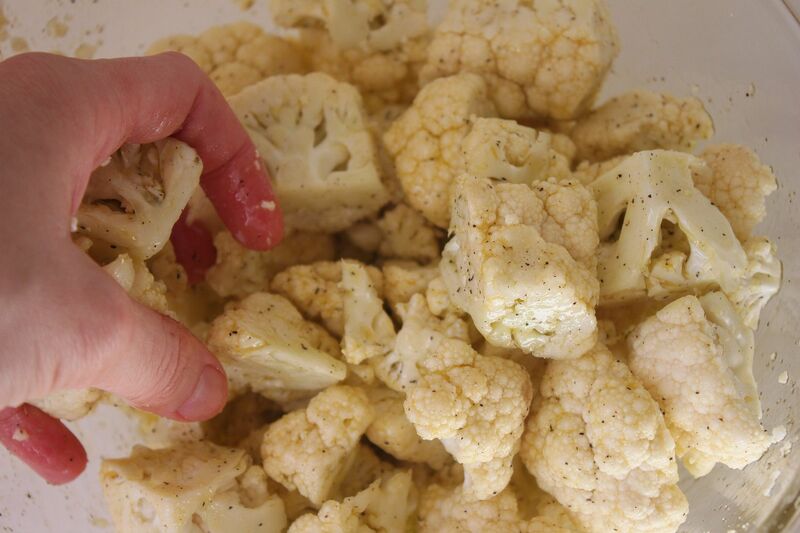 Place cauliflower pieces onto a baking sheet lined with parchment paper. Bake for one hour and turn 3 times during cooking until each piece has a nice brown coloring. The browner they are the better. I made these on Sunday and my husband loved them! He said they tasted like french fries (I agree). The great part is that you can happily eat the entire batch and not feel guilty at all. Amazing! This looks so good--and healthy too! You have the best recipes on here. Thanks for sharing! YUMMO! Totally making these! I love cauliflower!! Thanks Lindsay! I LOVE this idea! Yumm! Looks super yummy! Thanks for sharing. I am looking for some lower calorie snacks to replace the fries and chips!! And, I already like cauliflower. I've never heard of cauliflower as an alternative crunchy snack! You have so much self-control to consistently say no to your cravings and find something better instead! Wow, I'm definitely trying this! Our family loves cauliflower, thanks! French fries? Ok!! :) Thanks for posting! So glad for another healthy way to prep our cauliflower! Thanks for sharing. Oh my word, this looks SO GOOD! I am definitely going to make these! I have never heard of these! I'm going to try them! Looks yummy! Even though I love raw cauliflower I am going to try making these too! These look so delicious! Can't wait to make them myself. Omg this looks delicious! 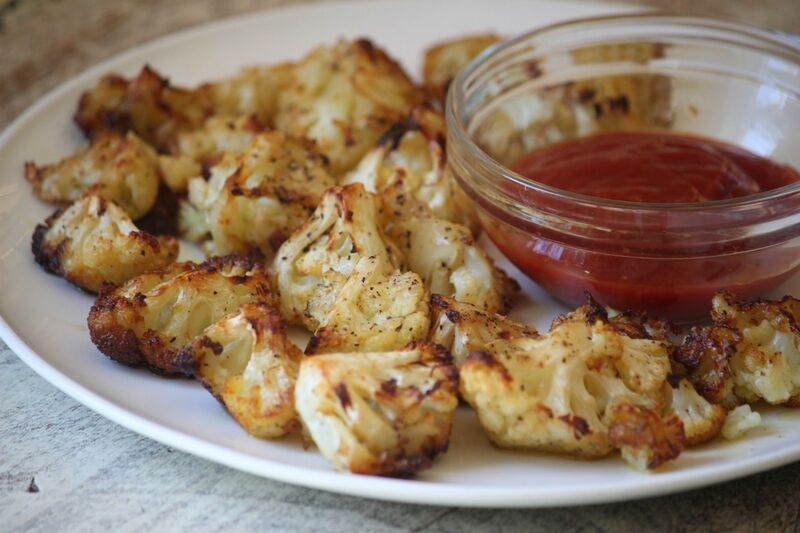 Cauliflower is one of my favorites, thanks for sharing this recipe! what a great idea.. i've never really been much into califlower but this recipe and the skinny mashed potatoes sound delicious. i'm going to have to try these. i MSUT try i absoutly love califlower..
Like french fries??! I'm sold. Ooo these look super yummy! Do you dip in ketchup?! Love this! Ok yeah, I definitely have to check these out. I LOVE cauliflower! Especially raw!! haha, but my husband hates it. Maybe this can ease him in. :) I love plain white popcorn with a little salt. At least it's super low-cal? fantastic idea--so healthy and yum too! thanks chick! I love cauliflower and french fries. Im sure this will taste great! This look so good! I liked your mash potato recipe too! Oh my gosh what a fantastic idea for cauliflower! I am a huge fan of cauliflower..raw..cooked whatever. Just found your site and love it! Just adorable! Following for sure! are you dipping those in ranch or marinara?? either way, i'm totally trying this on my 3 kids bc they eat zero veggies, except for corn;-) looks tasty!! I'm kind of embarrassed I wrote "ranch" previously as it's obviously red in color- I meant to say ketchup or marinara- ha!! Alright, I'm going to have to try this! I've been craving salty and crunchy and resisting buying chips or I will eat the entire bag in one sitting! Kale chips were a fail, but I can't mess up cauliflower, right?! YUM-O! i can't wait to try these out! add some cumin, paprika cinnamon and sugar and do the exact same as the rest of the recipe and they are sooo yummy. We do about the same - bake cauliflower, and then when it's just about done, toss shredded cheese on top (cheddar, smoked cheddar, smoked gouda, etc) and broil. SO good! I plan on trying these! so good! used the same recipe with sprinkled fresh rosemary. yum! I tried this tonight. This was SO very good! I am allergic to potatoes, so now I have something I like to replace french fries!! Thank you! saw these on Pinterest. Trying them tonight! I finally tried these tonight and LOVED them! Even my hubby liked them and he NEVER eats cauliflower! I will definitely be making these again. I LOVE cauliflower just never know what to do with it. Thanks for an easy great recipe! Tried these last night, and they were DELICIOUS! I don't even like cauliflower, but I will eat it this way any day! I just made these about 10 mins ago. And the plate is now empty. My 2 year old and baby in my belly LOVED them. These were delicious but they didn't get really crisp. I was afraid they'd burn if I left them longer. Any suggestions to make them crunchy not sure what I did wrong ? we loved them and can't wait to impress our friends with these! Thanks. So, I made these for the Super Bowl. I have to disagree that they taste like French Fries. HOWEVER - they are sooooo delicious! Thank you for the recipe - from now on, this is the way to make cauliflower in my house...yummmmm! ...oh, and normally I think cauliflower is nasty. Definitely not nasty when prepared this way. Thanks for posting! O wow! So cannot wait to try these! I almost think a spicy remoulade would go great, but then again I like a spicy remoulade on most vegetables. I made these and tried them with three diffent dipping sauces- ketchup, ranch, and bbq. I was not expecting to like ketchup at all (I typically only like it on french fries) but it was honestly the best of the three. They ACTUALLY taste like french fries! So yummy, thanks for sharing. Another one I can hardly wait to try... You really do have some fantastic recipes! These were absolutely amazing!!! I made 1/2 head of cauliflower because I didn't know how they would turn out. They were so good that I ended up eating all of it within a few minutes! When I cut up the pieces, mine didn't look like the picture....I had tiny pieces, small pieces, and medium pieces. I baked for 50 minutes directly on my stoneware, without the parchment. The tiny pieces came out burnt & very crispy, and the other pieces were mostly crispy, but in my opinion, all of it was extremely delicious!! I cannot wait to make these again! so i made these once... and then by popular demand i made them again the day after, and again the day after that. absolutely a success, thank you for the wonderful idea! These were amazing! 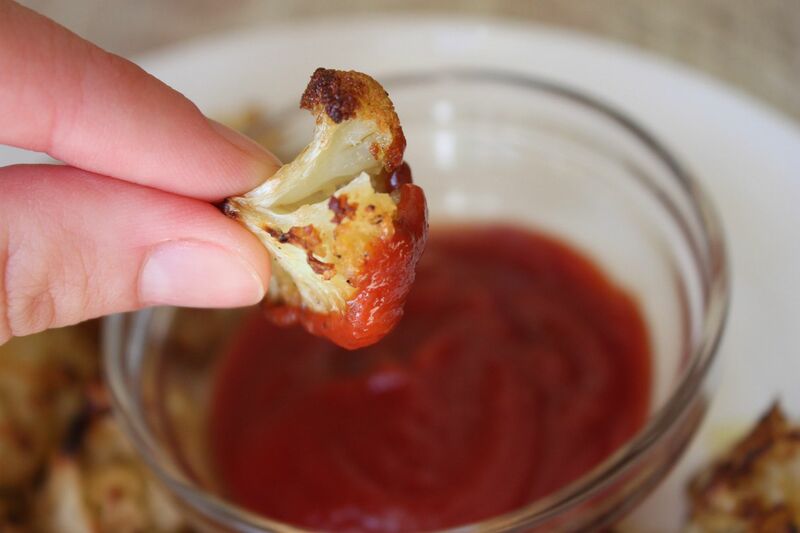 I added garlic powder and made a spicy ketchup to dip them in...my 3 year old and I ate a whole head of cauliflower in 1 sitting! Love these soooo much :) Heavenly! These are SO Yummy!! My 3 year old daughter, who tells me frequently that she doesn't like vegetables ate half of the batch by herself. I had to keep getting some out of the oven for her before they were done cooking because she couldn't wait to eat them. Delicious! I love the recipes I've tried so far and am stoked to make more. I am going to try this tonight. 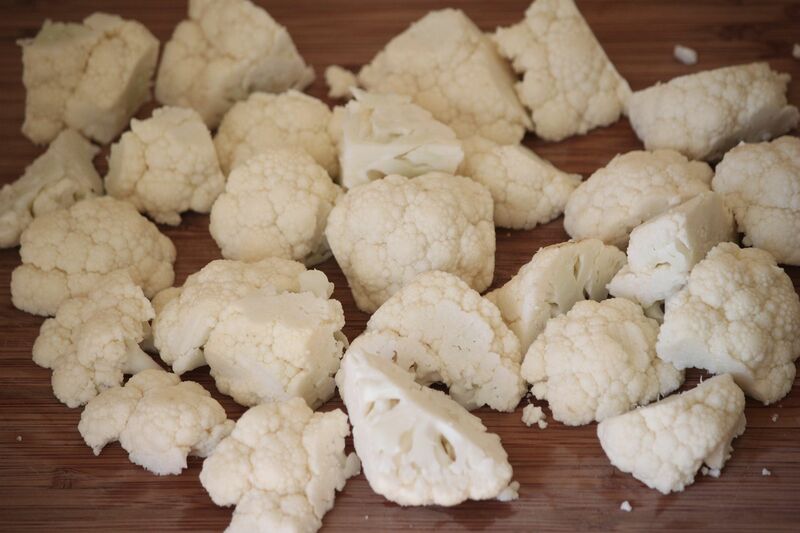 My mom used to make "brains" with cauliflower. Cover the entire head with a mixture of mustard and mayo and bake til tender. We use to fight over the outside pieces with the burnt "cheese" sauce. My mom used to make something similar, but they were breaded and fried. Because of that, I only made them on special occasions like Christmas and Thanksgiving. My kids LOVED them. This is so much healthier,now I can enjoy them ALL the time! Thank you! I made these and they really didn't go overly crispy! They WERE delicious, however, but I'm wondering how I can up the crispness. I didn't use parchment paper, could that be why? Maybe the pieces I cut were too large, not sure. Any suggestions/help/redirection would be greatly appreciated! :) Kudo's on the awesome blog, I love it! These are baking as we speak! Can't wait to try them! These were a hit! The whole family loved them! Do you think I could make these on my pampered chef pizza stone and not need the wax paper? I am going to try these very soon. I am always looking for more ways to my family to eat their veggies. These are great. The first time I made them I cut the pieces too small. They will forever be Cauliflower nubbins of goodness now. I tried mock mashed potatoes for the first time tonight (not your recipe - it sounds fantastic...must try it next time). I think I might like to try these as well. I see cauliflower being my new "go to" veggie. You can do the same thing with Kale and they're like potato chips! So good! This is our new favorite snack. I will now have to keep cauliflower on hand. Thanks! I got a similar recipe off of another website except they said cook for 10 minutes or until tender....well its been 20min and one hour sounds like about what it is going to take. Wish I found this recipe before the rest of my supper was ready. Guess it will make a good snack tonight. I love cauliflower made this way. I have been making it this way for years, but I add a TON of garlic!!! I have two heads in the fridge, kids and I will try with ketchup, YUMMY. Ha Ha, I was just looking up a recipe for roasting cauliflower. I got so sucked up into reading your blog that I mindlessly started eating my cauliflower raw and I ate the whole bag before I could actually try it. Oh well, next time;) This looks delish! The dish is delicious....I just feel like your cauliflower kept it's uniform shape, when mine seemed to shrink. Have you ever experienced that before?!? MADE THIS!!! It was TASTTTTTYYY. Thank you for sharing! In the oven now, can't wait! Would it be okay to cut the quantity of oil in half? why did mine not turn out crunchy???? I think this will be a favorite snack. OH my goodness! I will make these for my family tomorrow! They sound delicious!! Temp on the oven?? Thanks! These were amazing. They seriously tasted like French fries. Thank you! You converted me from a "Cauliflower Avoider" to someone who seeks out recipes made with this vegetable. Even my kids, who also had some of the "Avoider" in them are beginning to like this veggie. I tried this recipe last year, and it opened up a whole new culinary adventure for me. Tonight I am making these poppers again, and they are all for me (Note: making a 1/2 recipe). Thank you for sharing this great recipe. I made these today, and they were delicious. I halved the recipe, because I only had one head of cauliflower and I noticed that it was a bit too salty for my taste. Next time I probably won't use as much salt, but there WILL be a next time. So good. I ate them with my morning eggs. I tried to get my kids to try them but they refused :( Oh well, more for me. I'll keep trying though. Thanks for the healthy recipe. My doctor recently told me to eat more brocolli, cauliflower & brussels sprouts. I think this will fit the bill nicely. What kind of dip is in the picture? Do you think it can work with frozen cauliflower or will it come out too soggy? You definitely want to use fresh cauliflower not frozen. Can u dip them in ketchup or do you suggest something more healthy????? Made these for my family tonight and everyone loved them (even my 2 and 5 yr. olds). They did taste like french fries! We dipped them in ketchup. Great Idea! Made it tonight and loved it! Sounds great! What temp did you bake them at? Delicious!!! The best part is that my husband likes it too!! These tasted amazing thanks Lindsay!! Some were quite soggy - was that because I might have used too much oil? I had to guess a bit because I had less than a whole cauliflower. I'd love to try this! Question: do these get soggy if you don't eat them right away?? I don't have any parchment paper...think it will still turn out great? OMG! Linds? I can't believe it! I'm just sitting here playing on Pinterest, and WHAM your picture comes up next to these yummy photos! I had no idea! Love the page, can't wait to go thru all the yummy recipes! This was really good! I had tried another version of roasted cauliflower a couple of weeks ago that didn't turn out well, but we all liked this! :o) Thanks! I have made this more times than I can count. My husband and I love it, and eat a whole head of cauliflower in one sitting between us.